Just bought a King Tailgater Pro and two Wallys from dishformyrv.com (the Dish site for buying equipment). Had a lot of issues with the factory cables and the antenna and receivers not talking to each other. Apparently ( which they never mentioned) the Tailgater frequently is not compatible with the factory installed cables on a lòt of RVs, not just Redwoods . I've got to run a new cable to the receiver to make it work. Since running a new cable to the forward tv in the bedroom would be a really major undertaking, we've decided to just do the living room only. Called Dish and was told they do not accept returns on equipment!! Tried to return it to Pace Equipment, which apparently is their vendor and was told there would be a 25% charge for the return, but only if it was in the original packaging (which I don't have). So - if anyone needs a brand new Wally, I have one for sale very reasonably. Just know that if you order a setup, only order the receivers one at a time. Vaughan, something is not right. That was a cop-out on Dish's part, they have no idea what Redwood used for cable, and the Redwood cable is standard satellite cable. Even if it wasn't RG6, at worst you would get a weaker signal strength, not incompatibility. Don't give up on the second receiver. We used the existing Redwood cable to power 3 receivers in ours. I am currently having fits with my Wally. It has never connected to all the satellites the same twice, and requires hours of fidgeting. I had the Vip211 before that and it never had issues. We never had issues with the Hopper/Joey system in the Redwood either. I would say you either have a direct break in the cable, on the wrong cable, or the Wally is letting you down. Have you checked the cable with a sounder? Do you know someone with the Vip211 you could try out on your bedroom run? Like Brad, I have used our Hopper and Joeys in our Redwood since we bought it, in conjunction with the Winegard Travel'r. I'm certain that since your Redwood is just about the same age as mine, your factory installed cable is very good quality cable that should be "compatible" with any TV video signal. We have had absolutely no trouble in our coach whatsoever; only the hassle of getting Dish customer service to change our local station lineup as we travel down the road. We can use all three TV's to watch any and all channels as well as recorded programs on the Hopper's DVR on all three sets at the same time. We've never been told we can't use the Hopper on the road, but some have told of Dish not wanting them to. How much for the Wally? I was having trouble holding stations with my 6 year old VIP 211K receiver this winter. I got hold of a senior tech at Dish who suggested I stay away from the new Wally as they were having trouble with them. He suggested staying with the proven 211K so I bought a new one and problem solved. One thing I learned was that you must get to a senior Dish technician when having troubles with a Tailgater system. We will also have a Wally to sell or give away when we FINALLY begin full timing in June. I will move our Hopper 3 and 2 Joeys from the house into our 38GK. I have not attempted this yet, though. Jim & Mary and others who used similar....would appreciate any comments/help to set these up. I have the Wally only connected in the bedroom at this point. I also have one other issue as I changed over from DirecTV as they totally pissed me off a couple of years ago. Turns out the LNB on the Dish is longer than the Directv dish LNB, and sometimes when the Travel'r is searching, the LNB hits the corner of my mid ship AC unit and will stall there. I think I have a fix for that to extend the Dish Mount on the Travel'r about a half inch with some spacers. Like I said...I think!?! I also have the original Directv dish if anyone needs one. Turns out the LNB on the Dish is longer than the Directv dish LNB, and sometimes when the Travel'r is searching, the LNB hits the corner of my mid ship AC unit and will stall there. I think I have a fix for that to extend the Dish Mount on the Travel'r about a half inch with some spacers. Like I said...I think!?! I also have the original Directv dish if anyone needs one. That is unfortunate on the spacing. I installed my own Traveler, and to be honest I would have never given the fact I may switch service a second thought. Jim is your man for Hopper 3 - I never got that far, I only went as far as the first Hopper. 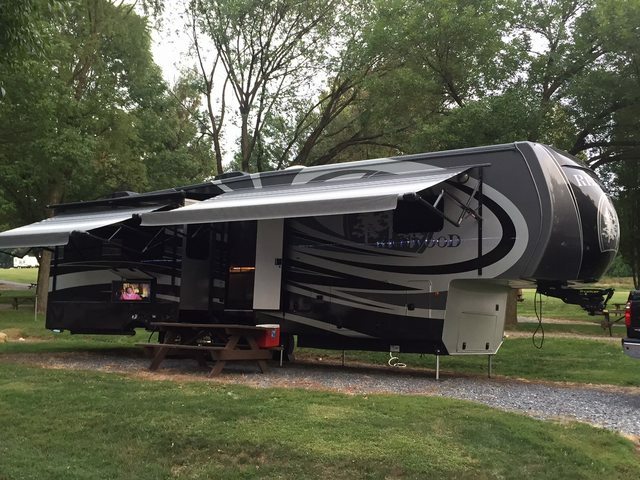 Vaughn, look on my post Dish hookup and usage, Jim posted a site from a gentleman who he says is very knowledgeable on RV hook ups, lots of advise on there for different setups, maybe some thing that can help you. I agree with Brad, I don't think its a Sat cable issue just something that needs to be done, also we are told when you call Dish ask for the RV division, so you get people who understand what you are trying to do. Good luck and don't give up yet.